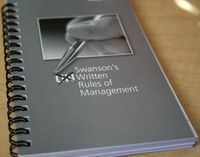 Den femte lagen i Swanson’s ”Unwritten rules of management” handlar om att när fakta dyker upp i en powerpoint presentation kan de anses vara allmänt kända och bör behandlas därefter. Presentation rule: when something appears on a slide presentation, assume the world knwos avout it and deal with it accordingly. Don’t think that what shows up in a presentation is private. It will come out. Accept this as a given, and deal with this fact up fron. As a leader, when people try to convice you that something you are looking at on the screen – proprietary, competiotnion sensitive and so forth – will never leave the room, assume it already has and deal with it accordingly. In fact, assume, that it will be puiblished in the New York Times, the Los Angeles Times or The Washington Post. And always maintain an atmosphere of total integrity. Hej fin sida =) Vill du göra ett länkbyte?